Background: Fungal infections are often difficult to cure in animals due to cost of treatment and emerging antifungal drug resistance. Herbal antifungals may be an alternate. Therefore, the objective of this study was to determine antifungal drug sensitivity pattern and activity of herbal antimicrobials on fungal isolates from clinical cases in animals and their associated environment. Methods and Findings: This study was conducted on 69 isolates comprised of yeasts (49) and moulds (20) isolated from clinical cases of animal (26) and environmental (22) samples and one reference strain for determining antifungal efficacy of common antimycotic drugs (amphotericin B, miconazole, nystatin, clotrimazole, itraconazole, ketconazole and fluconazole) and herbal antimicrobials viz., ajowan (Trachyspermum ammi) seed oil, betel (Piper betle) leaf oil, guggul (Commiphora mukul) oil, thyme (Thymus vulgaris) oil, marjoram (Origanum majorana) essential oil, Cinnamon (Cinnamomum verum) bark oil, holy basil (Ocimum sanctum) oil, citral, cinnamledehyde, carvacrol, lemongrass (Cymbopogon citrates) oil, sandalwood (Santalum album) oil, methanolic extract of Eupatorium odoratum leaves, Methanolic extract of Ageratum conizoides, essential oil of Zanthoxyllum rhetsa seed carp, agarwood (Aquilaria malaccensis) oil, and patchouli (Pogostemon cablin) essential oil amphotericin B (100 units), miconazole (10 µg), nystatin (100 units), clotrimazole (10 µg), itraconazole (10 µg), ketconazole (30 µg) and fluconazole (10 µg). Most of the yeast isolates except six from soil (2) and water (4) were sensitive to nystatin. Amphotericin B inhibited almost two third of the yeast isolates and miconazole was the most effective (75%) imidazoles followed by clotrimazole (38.8%), itraconazole (32.65%), fluconazole (18.4%) and ketoconazole (12.25%). Among herbals, thyme oil, carvacrol, cinnamon oil and cinnamaledehyde inhibited the growth of all the yeast isolates tested with MIC ranging from 0.001 mg to 1.2 mg mL-1. The next most effective herbal was holy basil oil (95.2%) followed by ajowan oil (87.75%), citral (87.75%) and lemongrass oil (77.75%). Lemongrass oil was equally antimycotic both on yeasts and moulds. The study revealed the promising antimycotic activity of herbs and prevalent antimycotic drug resistance among clinically important fungi in animals. 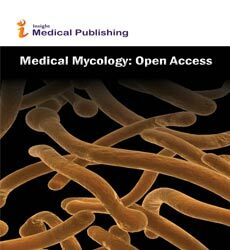 Conclusion: The fungi associated with animal clinical infections and their environment were often resistant to commonly used antifungal drugs but some of the herbals as cinnamon oil, thyme oil, ajowan oil and lemongrass oil as well as their active components have shown potential antifungal activity and hope for the future drug development.